We have tons of this growing in our yard. We also have wild Indian strawberries growing beside our house. I had not realized that Kudzu could be used as a herb and food. God may have provided this plant for us to use in the post 2012 world. This does sound tasty. In a medium bowl , beat 1 egg. Spread mixture evenly in prepared pan, making a crust. Refrigerate until ready to fill and bake. Cook kudzu leaves in a small amount of water, press to remove moisture and chop fine. Add butter and set aside. In a medium bowl , beat remaining 3 eggs. Stir in salt, cottage cheese, Parmesan, heavy cream, hot sauce, and nutmeg. When its all blended, stir in kudzu. Pour into prepared rice crust. Bake 30-35 minutes or until firm. This is an extremely invasive plant! "It is perfectly valid as a food source," says Regina Hines, a fiber artist in Ball Ground, Ga.
it for erosion control. The government paid farmers as much as $8 an acre to plant fields of the vine. poles, clogging train tracks and covering parked cars. it. But kudzu can take years to successfully treat with herbicide. Its roots can run 10 feet deep. BTW Lori, thanks for starting this Topic! Kudzu can be fed to livestock too. Better than alfalfa for nutrients. The whole Kudzu plant can be eaten, flowers, tender leaves, roots. It is sort of creepy. It will grow right over all buildings and take over every single thing. 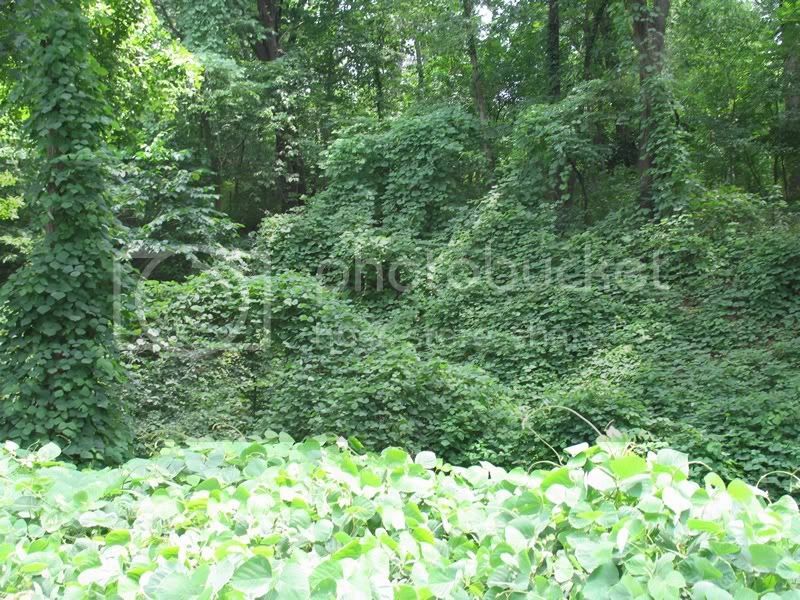 Kudzu overgrows the city of Atlanta. Thanks, Susan I will use that since I'm right here in S.C.
Of course you might need a machete to get into the darned place. Gee it would cover up everything. Couldn't be seen from the road from the air nothing! If you had a partially buried dome you could plant the kudzu all around and on top as long as it didn't cover the ventilation shafts, eh? I think I already posted this but oh well! June 16, 2008 -- As concerns rise over corn ethanol creating competition between food and fuels, ethanol made from one of the country's most invasive plants -- kudzu -- could be part of the solution, according to Rowan Sage of the University of Toronto and colleagues at the U.S. Department of Agriculture. The kudzu vine, also known as "the plant that ate the South," was brought from eastern Asia in 1876 and can grow more than 6.5 feet a week. Its starchy roots plunge deep into the soil, and just a fragment of the plant remaining in the ground is enough to allow it to come back next season. "Kudzu is just a large amount of carbohydrate sitting below ground waiting for anyone to come along and dig it up," Sage said. "The question is, is it worthwhile to dig it up?" His team gathered samples of kudzu from different locations in the south at different times of year and measured the amount of carbohydrate -- which can be converted into ethanol by yeast -- present in leaves, vines and roots. The roots were by far the largest source of carbohydrate in the plant: up to 68 percent carbohydrate by dry weight, compared to a few percent in leaves and vines. The researchers estimate that kudzu could produce 2.2 to 5.3 tons of carbohydrate per acre in much of the South, or about 270 gallons per acre of ethanol, which is comparable to the yield for corn of 210 to 320 gallons per acre. They recently published their findings in Biomass and Bioenergy. Crucial to making the plan work would be figuring out whether kudzu could be economically harvested, especially the roots, which can be thick and grow more than six feet deep. To balance this expense, Sage said, the plant requires zero planting, fertilizer or irrigation costs. Even if equipment could harvest the roots, a large fraction of kudzu vines blanket steep hillsides and would be difficult to access. The team estimated that about one-third of kudzu plants would be harvestable. If so, they calculate that kudzu could offer about 8 percent of the 2006 U.S. bioethanol supply. "It's not going to solve anybody's energy crisis, but it would be a useful supplement," Sage said. "You could use it to get rid of the kudzu," he said, "or, alternatively, you could let it regenerate naturally, and just walk away and then come back and do it again in a few years." "There is a conundrum there," said Irwin Forseth of the University of Maryland in College Park. "Unless you're going to let it come back and devote some land to cultivating it, it wouldn't form a stable source. You wouldn't want to put in a stable infrastructure and work out how to extract it from roots to have it go away after three years." He advocates using the starch for food and converting the cellulose -- the woody, fibrous carbohydrate that gives structure to the stems and leaves -- into ethanol once processes under development are commercially available. The fibers also make fine textiles, Tanner said. "My suggestion is, be creative. Don't cuss at it. Use it creatively."